Now Mabel Ohman Johnson was my dad’s aunt by marriage. She began her life on Swan Johnson’s farm as a hired girl and ended it as a wife, mother, grandmother, and great-grandmother in what can only be called an age-old tale. She fell in love with farm’s youngest son, Theodore Swan Johnson. They were married on February 19, 1927. But to begin with, Mabel didn’t just go on the tramp looking for service work knocking on farm doors up and down what is now County Highway 50 when the time came for her to make her own way. No. Mabel and her future husband were part of a interconnected community spanning two countries. No one descended from this ancestral web can fully figure out the intricacies of its ties now. However, Ted and Mabel were clan (släkt in Swedish)–their DNA shared if one cared to look back far enough to the small parishes in Sweden from which they were descended. A new släkt had grown up around the farm in Compton Township, Otter Tail County, Minnesota. While employment took some of its members to nearby towns, Compton, with its church and school and family farms, was the hub. In the case of Mabel’s folks, they lived up the road four miles from the family enclave in the small hamlet of Deer Creek, Minnesota. Her dad, Alfred Ohman, I believe worked for the railroad. Which brings me to the slight uneasiness of clan for us nowadays. My father said that growing up he “was related to everyone in the neighborhood.” But what he didn’t say was how many times he was related to his neighbors. In the case of Great Aunt Mabel, her father Alfred was my paternal grandfather’s older brother which made my father and Mabel first cousins as well as nephew and aunt (Ted being my dad’s mother’s brother). But back to the picnic. In late summer of 1994, Great Aunt Mabel, now in the twilight of her years, decided the throw her last picnic on the farm (or so she said) at the end of September, the last Sunday in September to be exact. We were all invited via the old fashioned way of word of mouth, or at least I was. By this time, Ted had died and so had his brother and farming partner “Ock”. Section twenty of Compton Township, once full of extended family and friends, was sparse now with maybe one or two exceptions. Gone were the eighty acre farms, each with its own pack of kids and a hired man or two or a recently immigrated relative learning to stand up in a new country. Gone was the church around the corner and up the road a bit having been torn down and merged with a congregation in town. The school house too at the intersection of County Highways 73 and 50 had been closed for decades, its school mistresses no longer boarding at the farm. Yes, the neighborhood was quiet now. The red screen door at the kitchen banging and squeaking less and less as it fell into only occasional use or was completely gone, having been replaced with something new and vinyl. Yet I imagine a time when kids, a teacher, two grown men, and a farm hand kept that door busy from sun up to sun down with Mabel wondering when Ted would get around to oiling the darn thing. Now, its infrequent squeak signaled something different for Mabel maybe—something to look forward to. So we went, my dad, brother, and I. It may have been over a decade since I had been up to the farm. The Ohman homestead was sold while I was still in grade school and now some other structure stood where once the pioneer log cabin had. “The farm” on which Great Aunt-Mabel had spent most of her life and as everyone still calls it, was one of the only family places left in the area that I had any known connection too. 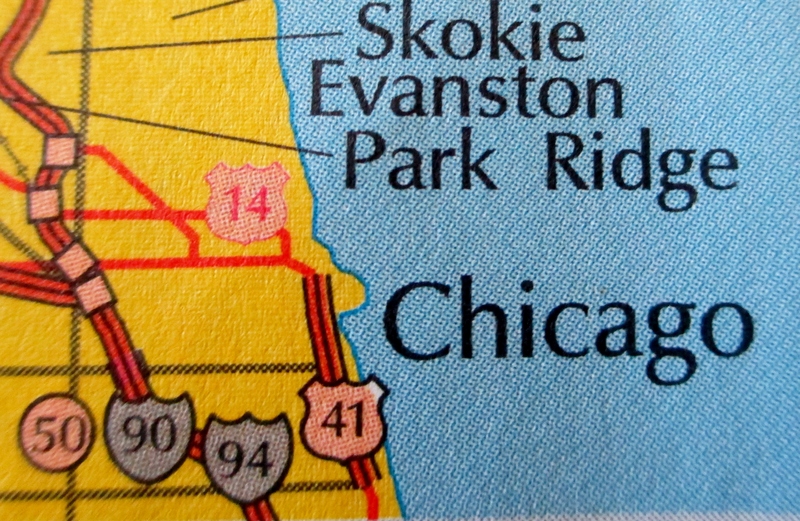 My brother and I both lived in Chicago at the time of Mable’s invitation. 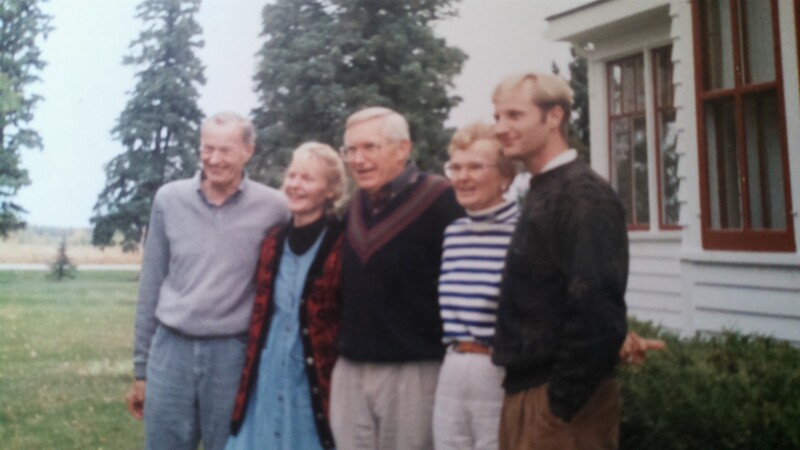 Dad drove over from Moline, picking us up at Peter’s apartment and we drove up through Wisconsin with its hills and limestone cliffs on Interstate 94 toward the twin cities. We merged onto highway 10 outside the cities climbing north and west toward Wadena. Ted and Mabel’s farm wasn’t the original land for our family. 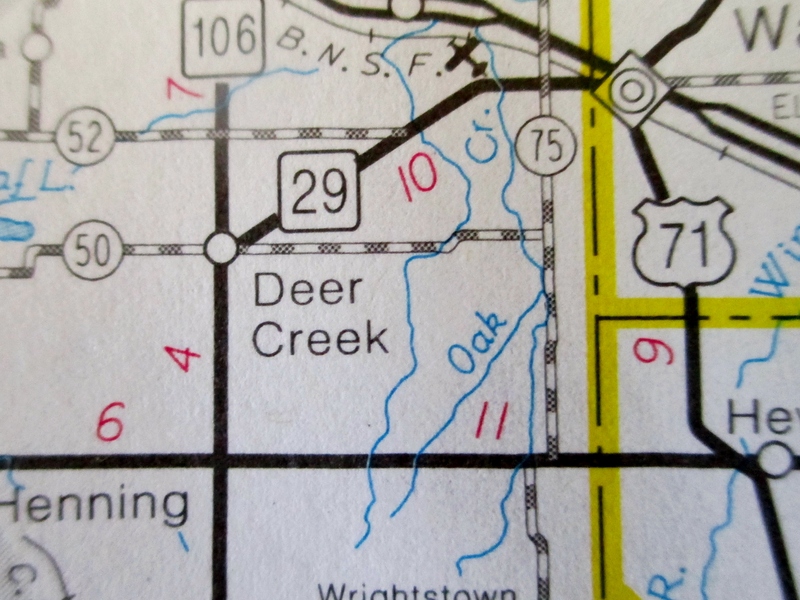 The original homesteads sat along County Highway 73—the farms of Olaus and Annicka Anderson and Petter (Peter) and Johanna Johanson (Johnson). When Swan and Pete, twin sons of Petter and Johanna, were ready for their own adventure they struck out down the road and to the left to buy land most likely from the railroad and make something of it. Pete married first, a woman named Emma, and the three lived together on the farm until Pete sold out to Swan. Pete then moved over to the original Johnson homestead about the time Swan married Beda Anderson, Olaus and Annicka’s daughter. Swan’s sons, Ted and Ock, officially took over the farm upon Swan’s death in 1920 and farmed for decades together. So as Swan, Beda, Ted, Ock, and a whole host of other family members resided in their resting places up the road in the Compton Swedish Lutheran Cemetery or in the Gustafva Cemetery a little farther away on that last day of September in 1994, Great Aunt Mabel threw her picnic and once again, the neighborhood teamed with family and life. Amidst all the doings of the day, Mabel showed us the family artifacts she had in her possession. 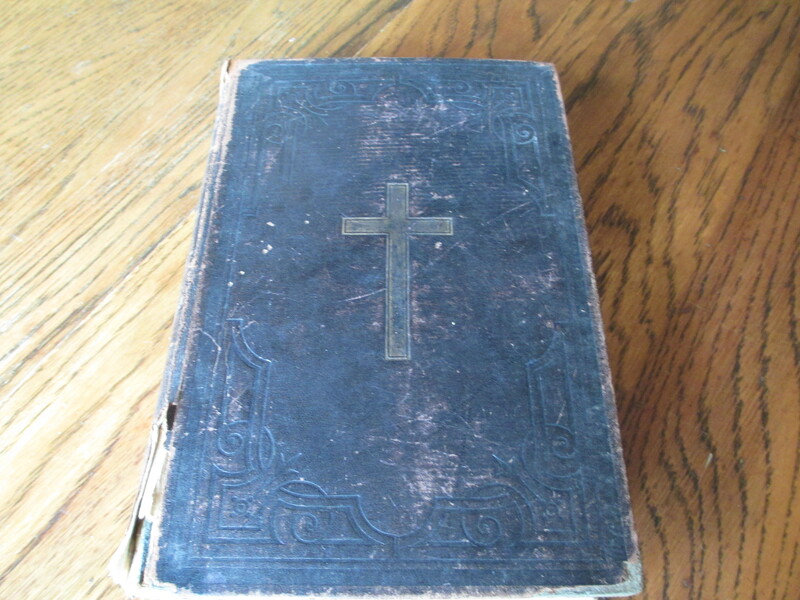 A small group sat in the dining room, a room full of fabulous food memories, looking at the family bible, a Swedish psalm book, and my Grandmother Emma’s favorite prayer. Mabel seemed sad that I had spent so little time up in this neck of the woods. She wondered what I even remembered of the Ohman cabin which was nothing like the large farmhouse she now sat in. “The match box,” is what I told her. It hung on the kitchen wall at the Ohman cabin painted along with everything else every time Grandma Emma felt the need. 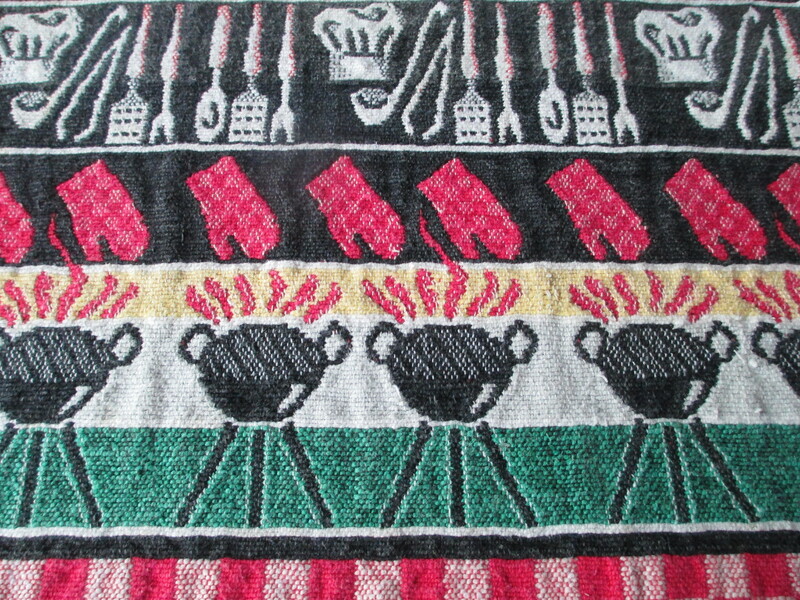 I remember it being yellow or light pink and the smell of its matches lighting the stove each morning. It seemed such a small thing but it’s the small things that stand out for us as children. Match boxes are an old tool from the days of when lighting the morning fire was one of life’s main necessities. Search the term online and see the many boxes from around the world that show up. At one time a matchbox was a mainstay of every home. This one hung by a small mirror near the back door that faced the barn and water pump and wasn’t much to look at. Thinking back it was really nothing. A piece of tin molded into a shape to fit the rectangular match boxes of the day with a receptacle at the bottom for catching stray matches. 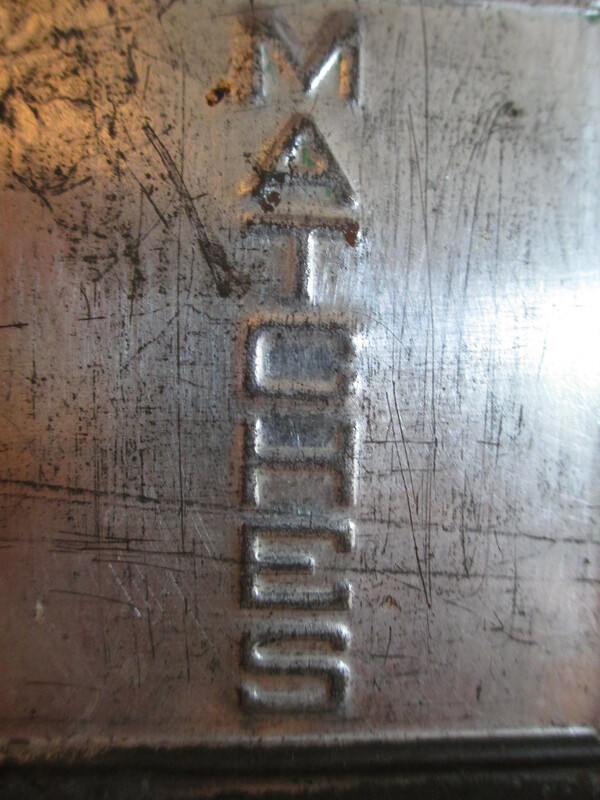 It even had the word “matches” popping out of the tin and a little hole at the top for hanging. 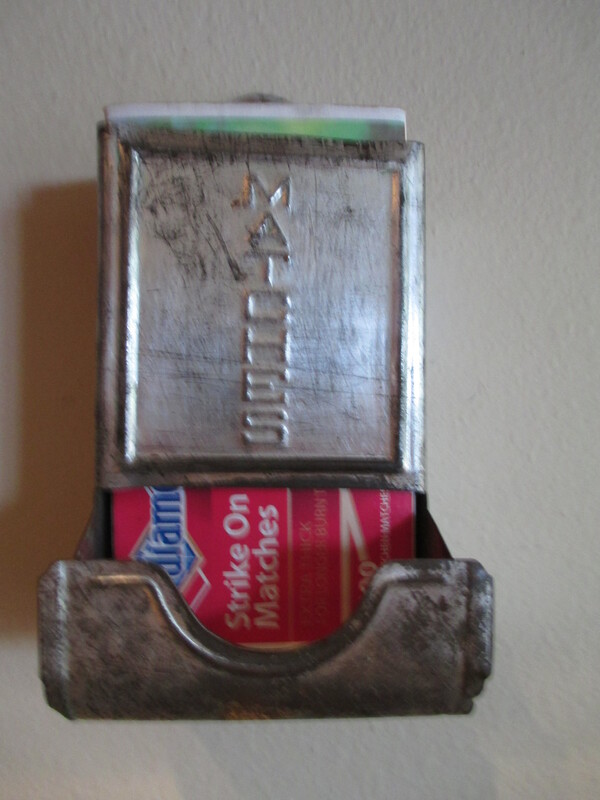 Like so many things on the farm the match box was strictly utilitarian. “Oh, that old thing,” said Great Aunt Mabel, “It’s out in the shed,” I probably just nodded and smiled in response. While these were my people, I had not grown up around them. Their ways were both familiar and foreign to me. Why Mabel would have kept the Ohman’s match box was beyond my understanding. At any rate the picnic was a huge success, a day full of family happy to see each other, walks back to the creek running through the property, and lots of food! I think we were all sad to leave late that afternoon. But it was time to head for Minneapolis and back to Chicago. Dad dropped Peter and I at the airport in the evening and we flew back to Chicago—Peter for graduate school and I to begin a new job on Monday. Early the next morning, I put on the same denim dress I had worn the day before. I was a bit tired from my travels and feeling ambivalent about this new job which was nowhere near my “dream” job. Maybe I also missed the gathering of clan, the collective memories of visiting still clinging to my dress. Mabel couldn’t make the wedding but sent a gift which we opened the day after. Unwrapped, we found a set picnic placemats reminding me of what seemed the penultimate event to what had just happened the day before. But underneath the placemats was something more. The old match box gleamed up at us, stripped and restored to its original tin. Tony had no idea what this thing was. But I did! A bit battered and scratched, it moved me the way only acts of deep understanding can. Mabel was reminding me of something deeper than just a picnic. It took a few years of moving around the country before Tony and I hung the match box. Like many of our possessions in the early years of our marriage, it remained boxed up with other gifts or trinkets from our separate travels or lives before each other. 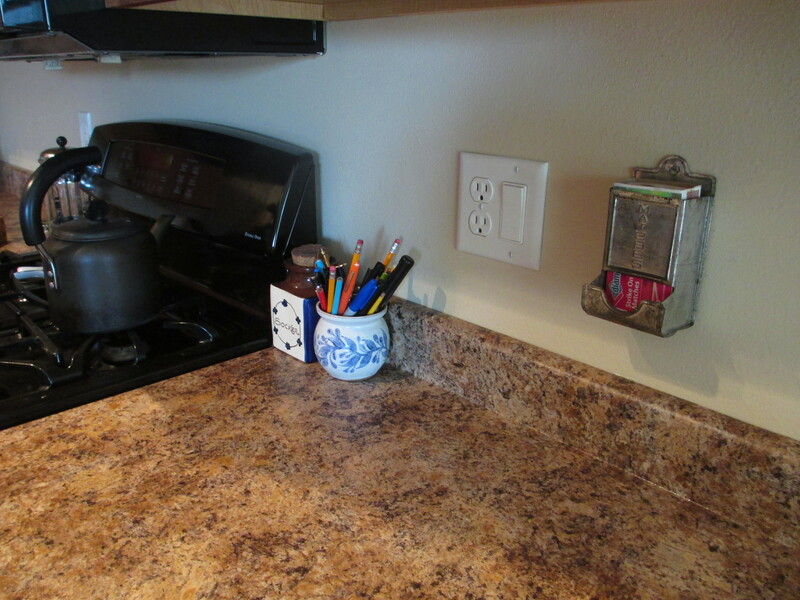 Now the matchbox hangs next to our modern gas stove which will never need its usefulness. The receptacle overflows with matches for our dinner candles and not our daily bread. I saw Mabel one last time the summer of 2001. She was off the farm living in a nursing home I think in Fergus Falls. She lay in bed and held my hand. That’s what I remember. Mabel died the next summer. One of Mabel’s granddaughters lived on the farm for a while. But here not so long ago, it too was sold only for the buildings to come back on the market recently. Maybe the old place can’t satisfy itself amidst strangers–people who are not släkt . The farm had, after all, become the clan’s stronghold for the generations still living. Its erasure which may be inevitable leaves us only with what we can carry with us as the landless people we now are–our memories, our stories, and bits and pieces of a time no longer in existence. The Johnson twins, Swan and Pete, did not take advantage of being confirmed with their fifteen year old sister Emma in 1880 when the first Lutheran confirmation occurred in Compton Township, Minnesota. They didn’t budge the next year either when Swan’s future wife, Beda at age fourteen, was confirmed. Now one might think these two had been confirmed at an earlier date. The custom in pioneer Swedish communities was to confirm around the age of fourteen or so. But in 1880 Swan and Pete were twenty years of age—men by the standards of their day. In 1874 when the twins were of the confirming age, the family was farming in Dakota County near Rosemount, Minnesota. In 1875 they show up in the Minnesota Census as a part of a small group of forty-four Swedes mixed in among a lot of Irish immigrants, a few Germans, and maybe a couple of Norwegians. Now there wasn’t a Lutheran church in sight of Rosemount at the time. One popped up in Hastings in 1871. But Hasting was about fifteen to twenty miles from their whereabouts in Dakota County and not a trip to make very often on poor roads and in certain types of weather. Sweden at the time only allowed one Christian denomination by law. You were either Lutheran or risking incarceration. The twins’ parents, Peter Johnson and Johanna Anderson, were both confirmed Lutheran Christians. Their confirmations were duly noted in the Swedish household examination records of the time along with other particulars such as birth dates and small pox vaccinations. Once in the new land many Swedish immigrants chartered new Lutheran congregations or joined existing ones. Others however went in search of something novel and now legal. Swedes seeking spiritual change account for the Swedish Baptist, Swedish Methodist, and Swedish Covenant churches throughout Minnesota. Still some Swedes sought some spiritual peace opting to leave faith matters of any kind behind them in the hills of their homeland. There was a Methodist Church near the family in Dakota County. It was incorporated in 1868 and the building was being built in 1874. The church is on the 1879 plat map of Rosemount way over in the Western corner of section 30. I’m not sure the family had pietistic leanings though. There’s no mention in the family legend of anything of this sort. And being it was a German Methodist congregation (and not a Swedish Methodist congregation) makes me think the family may have shied away from it. Swan and Pete however as well as their older brother Johan Gustaf and their younger sister Betsey all came of confirming age while living in Dakota County. With few choices, what did the family do? Travel to Hastings? Confirm in the Methodist Church? Or chose to do nothing? Born February 15th, 1860 in Carver County, Minnesota, Andrew Peter and Svante would have had plenty of opportunity to be baptized. Carver County was an active Swedish community boasting two Swedish Lutheran churches within five miles of each other and within the area the Johnson family was living at the time with another family from home. The twins were born twenty months after their parents landed in Boston, Massachusetts and nineteen months after their brother, Johan Gustaf, was born. Surrounded by family and friends from home, life in Carver County was most likely full of past traditions. Church records for the East Union Lutheran Church in Carver County are messy and difficult to decipher. 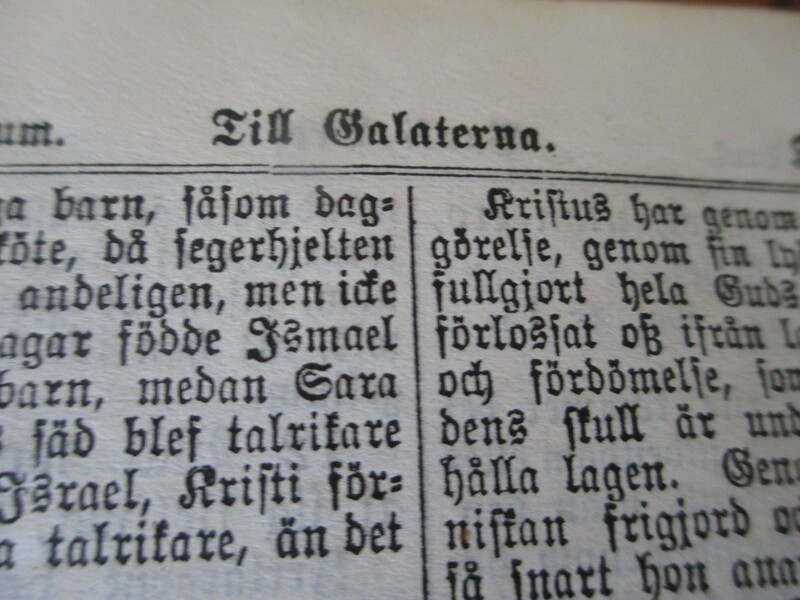 However, while not stellar, the church records of the Compton Swedish Evangelical Lutheran Church prove legible. The records note the twins were baptized in 1860 in Carver County. 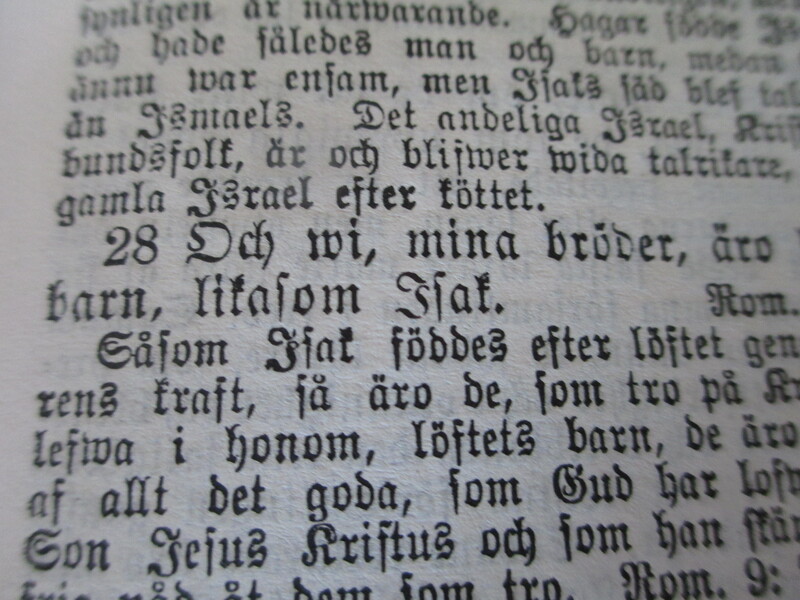 Reading on, a small and somewhat messy notation in Swenglish written in these same church records indicate that 1909 was a big year for the twins. At forty-nine years of age Swan, Pete, and Swan’s son Fredie (age fourteen or so) where all confirmed in the Compton Church. We may never know what prompted this late confirmation. One thought is that their mother’s death the year prior caused the twins to do some thinking on spiritual matters. Perhaps they knew Johanna regretted not finding a way to have her children confirmed in Dakota County. Maybe the twins’ confirmation was fulfillment of their mother’s final wish. Well that is one thought. My other thought lies within the power of Beda Anderson Johnson. Beda, according to legend, spoke her mind. She could have nagged Swan at precisely the most aggravating yet effective moment about this confirmation thing. The couple already had one child confirmed in 1907 and now another one was ready to go. Yet here was the father still unconfirmed and living just down the road from the church! Like music I can hear a roll of Compton chuckles spill out over the table, the children listening and Emma smiling as she finishes up the dishes. Then I imagine Swan and Pete sighing in surrender to the matrimonial fates conceding without words that the power of two women in cahoots is not to be reckoned with. And I think I’ll just leave it at that—a few interesting facts about the cloud of witnesses who came before me rolled into a whole lot of conjecture about another time and another place that makes for somewhat of a passable story to tell. The Swedish language of the Minnesota pioneers. Federal Census of 1860 for Carver County, Minnesota. Minnesota State Census of 1875 for Rosemount in Dakota County, Minnesota. Records for the bark, Minona, accessed at the the Swenson Swedish Immigration Center at Augustana College, Rock Island, Illinois. Rosemount Plat Map of 1879. Courtesy of the Dakota County Historical Society. Accessed 9/28/2012. 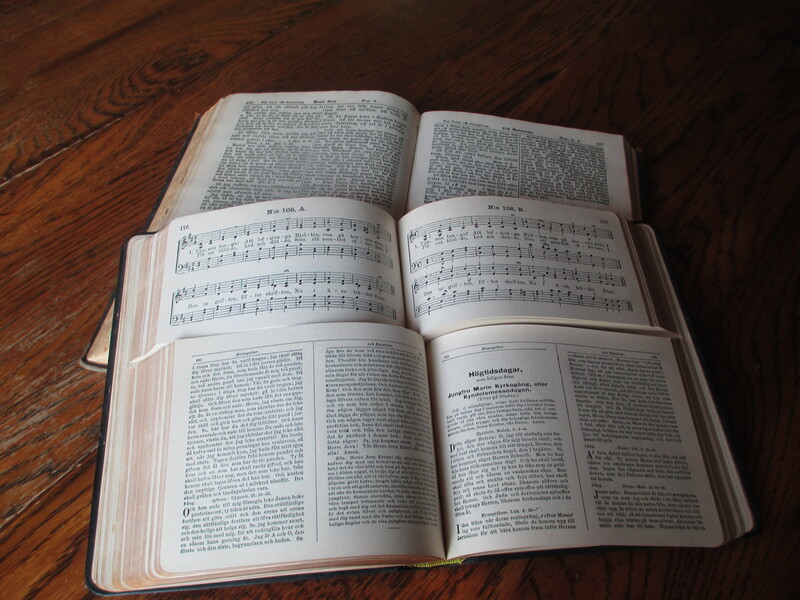 Rosemount United Methodist Church at http://www.rosemountumc.org/about/our-church-history/ Accessed on April 15, 2015. Swedes in Minnesota by Anne Gillespie Lewis. Published by Minnesota Historical Society Press. 2004. Swedish-American Church Records: Swenson Swedish Immigration Center at Augustana College, Rock Island, Illinois. http://www.augustana.edu/general-information/swenson-center-/genealogy/church-records/minnesota. Accessed on April 17, 2015. 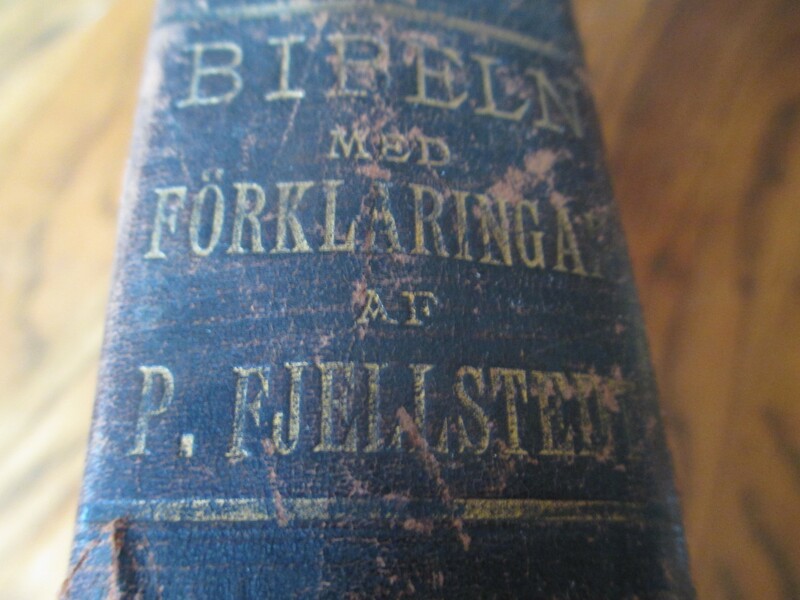 Swedish New Testament Bible found in the Ohman homestead. © Jennifer Ohman-Rodriguez and Jenniferohmanrodriguez.com, 2015, 2016, 2017, 2018, and 2019. Unauthorized use and/or duplication of this material without express and written permission from this site’s author and/or owner is strictly prohibited. Excerpts and links may be used, provided that full and clear credit is given to Jennifer Ohman-Rodriguez and Jenniferohmanrodriguez.com with appropriate and specific direction to the original content.